Timeplus Responsive Prestashop theme is an upward trend for web design especially e-commerce stores. Mega Menu offers an effective way to improve website usability and navigation! Using this module it can be possible for you to display not only category list but also special products, CMS links, etc. With fewer click, customers can be saving their time to get to where they really want. 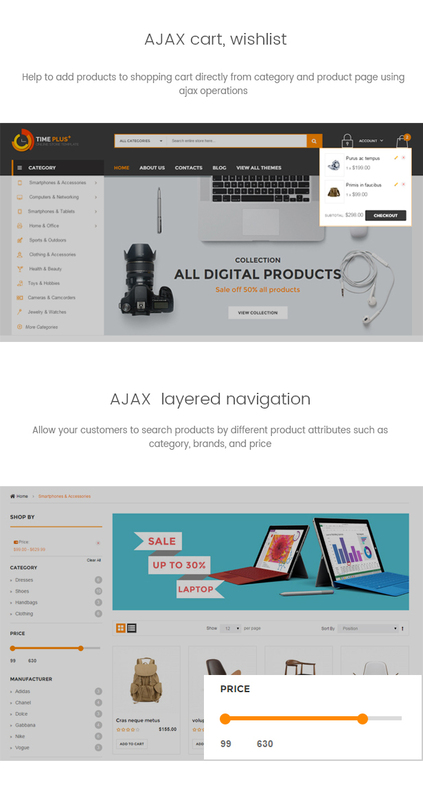 Highlight in homepage is Vertical Mega Menu with many products categories. Each main category contains a pretty thumbnail image. Vertical Mega Menu is always shown on the left besides Slideshow in home page. Better highlight is Category List Slider. It’s very fantastic. You can show thumbnail image of each product category in each tab to horizontal and vertical direction. Beside, list of subcategories of a main category is also displayed according to your need. Time until the end of promotion is very lively in Daily Deal module for discount products, which are shown on featured products slider extention. Products Slider modules such as new products, related slider are beautified neatly on your website. Blog is place that helps advertise your online store more popular to consumers. Brand Logo of famous brands or your favorite brands are beautiful in slider near Footer. You can also search products in each category with Search By Category. Special is Theme Editor extension and RTL language. With Theme editor, you can configure every aspect of Timeplus’s features. RTL allow easily change from left-to-right script. 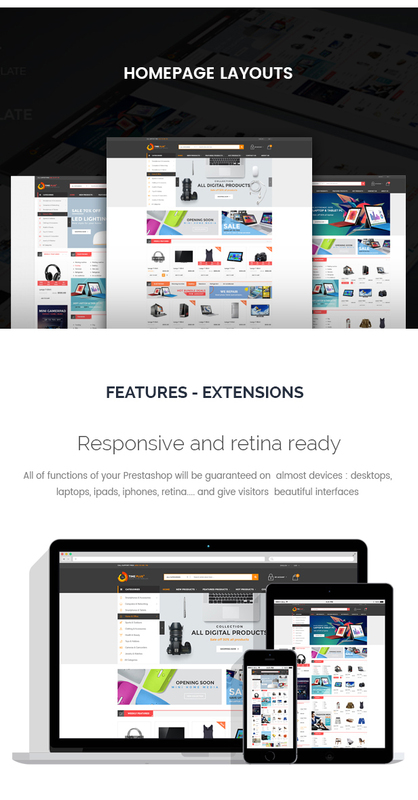 Let’s enjoy and purchase Timeplus Prestashop theme! Flexible layout format comes with various styles. Works like a charm on any devices, any resolutions. Font Awesome icons fully integrated. You can add products to cart without leaving current page. Show a Product image Zoom when clicking on product in detail-page. Easy define column left or column right for each page in admin panel. 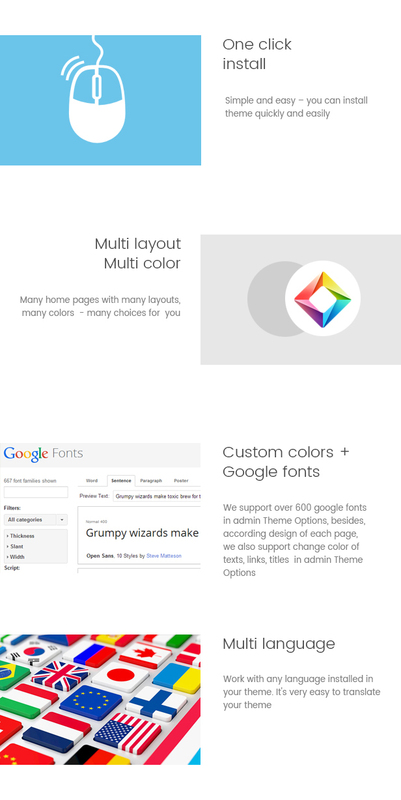 Using Google Fonts, Standard Fonts, or Upload Your Custom Font! Note: All images are just used for preview purpose only and NOT included in the final purchase files. Our support team guarantees to respond you within 24-72 working hours from Monday to Friday. You can send us email to http://www.plazathemes.com/tickets/. We will process tickets and respond you to in the queue order. BootstrapDeive.com is committed to safeguarding your privacy. Contact us at if you have any questions or problems regarding the use of your Personal Data and we will gladly assist you. You can configure your Internet browser, by changing its options, to stop accepting cookies completely or to prompt you before accepting a cookie from the website you visit. If you do not accept cookies, however, you may not be able to use all portions of the BootstrapDeive.com Websites or all functionality of the Services.